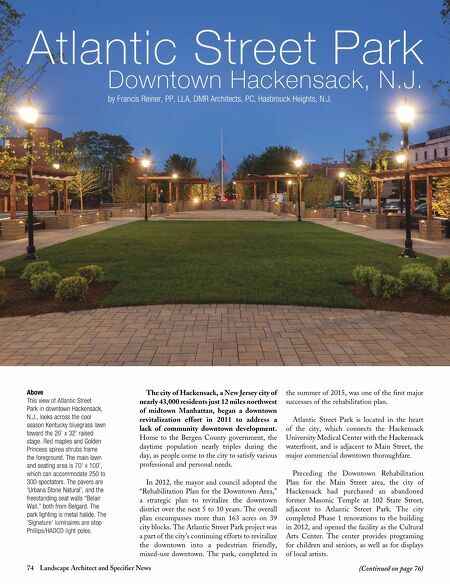 74 Landscape Architect and Specifier News The city of Hackensack, a New Jersey city of nearly 43,000 residents just 12 miles northwest of midtown Manhattan, began a downtown revitalization effort in 2011 to address a lack of community downtown development. Home to the Bergen County government, the daytime population nearly triples during the day, as people come to the city to satisfy various professional and personal needs. In 2012, the mayor and council adopted the "Rehabilitation Plan for the Downtown Area," a strategic plan to revitalize the downtown district over the next 5 to 10 years. The overall plan encompasses more than 163 acres on 39 city blocks. The Atlantic Street Park project was a part of the city's continuing efforts to revitalize the downtown into a pedestrian friendly, mixed-use downtown. The park, completed in the summer of 2015, was one of the first major successes of the rehabilitation plan. Atlantic Street Park is located in the heart of the city, which connects the Hackensack University Medical Center with the Hackensack waterfront, and is adjacent to Main Street, the major commercial downtown thoroughfare. Preceding the Downtown Rehabilitation Plan for the Main Street area, the city of Hackensack had purchased an abandoned former Masonic Temple at 102 State Street, adjacent to Atlantic Street Park. The city completed Phase 1 renovations to the building in 2012, and opened the facility as the Cultural Arts Center. The center provides programing for children and seniors, as well as for displays of local artists. Above This view of Atlantic Street Park in downtown Hackensack, N.J., looks across the cool season Kentucky bluegrass lawn toward the 20' x 32' raised stage. Red maples and Golden Princess spirea shrubs frame the foreground. The main lawn and seating area is 70' x 100', which can accommodate 250 to 300 spectators. 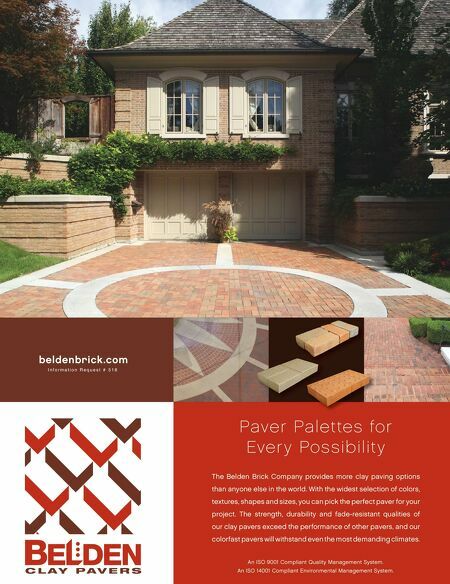 The pavers are 'Urbana Stone Natural', and the freestanding seat walls "Belair Wall," both from Belgard. The park lighting is metal halide. The 'Signature' luminaires are atop Phillips/HADCO light poles. (Continued on page 76) Atlantic Street Park Downtown Hackensack, N.J. by Francis Reiner, PP, LLA, DMR Architects, PC, Hasbrouck Heights, N.J.